Melodiya, the most famous Soviet record label, is celebrating its 50th anniversary. Melodiya was the first label in the USSR to release music by The Beatles, The Rolling Stones, and other international music artists, as well as the only record company to release Paul McCartney’s album “Back in the USSR”. 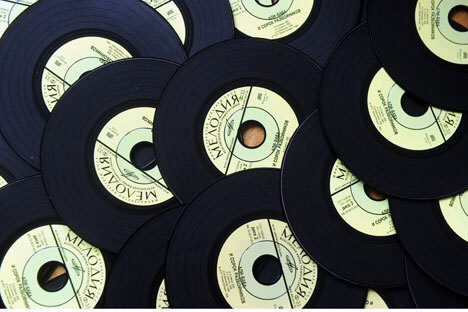 Melodiya, the most famous Soviet record label, is celebrating its 50th anniversary. Melodiya was the first label in the USSR to release music by The Beatles, The Rolling Stones, and other international music artists. Below are a few interesting moments from the history of Soviet recording. Though it is commonly believed that there was no such thing as copyright law in the Soviet Union, this is not entirely the case. The concept of copyright law first appeared in 1925, when copyright regulations were introduced into Soviet legislation. In 1973, the Soviet Union joined the Universal Copyright Convention. But only partially. Partial involvement in the Universal Copyright Convention enabled the record label Melodiya to freely dispense imported musical material. For example, Beatles tracks frequently appeared in various compilations released by Melodiya, but the company would either omit or misspell the band’s name. In 1987, Melodiya released a series called “The Archives of Rock Music”, which later became known as “The Archives of Popular Music.” The series contained compilations of British and American rock artists from the 1950s-1970s, and included songs by Elton John, The Doors, The Rolling Stones, Stevie Wonder, Elvis Presley, and many others. Judging by the information on Melodiya’s record covers, the company did not purchase any licenses for these tracks. On the other hand, because Melodiya had signed a partial agreement with the Universal Copyright Convention, the company wasn’t required to pay any fees for foreign artists who released tracks before 1973. Melodiya actively exported records by Soviet musicians. At first, the company was represented by an association called Mezhdunarodnaya Kniga on the international music market. In 1965, the German company Ariola-Eurodisc signed a contract with Melodiya to release classical music records in the Federal Republic of Germany. The American company Capitol also signed a contract with Melodiya in 1965. Capitol planned to release over 300 million records in collaboration with Melodiya over a period of four years, and the company Melodiya-Angel was created for this purpose. The project was wildly successful, and Melodiya’s records received the esteemed Gold Record award. Afterwards, according to data from 1970, Melodiya traded with than 60 countries. Its main musical export was, of course, classical music. The company repeatedly won the most prestigious independent international awards in classical music (the International Classical Music Awards). The last time Melodiya received an ICMA award was last year, for its release of the CD Russian Seasons with Igor Stravinsky, as well as this year, to mark the company’s 50th anniversary. In 1988, Paul McCartney recorded the album Back in the USSR with Melodiya. The album was released only in the USSR and was not sold in other countries. This fact piqued the interest of fans worldwide and fueled the hype surrounding the record. McCartney himself claimed that he wanted to turn the situation in the world upside down and let people on the other side of the hemisphere know what it was like for Soviet music lovers to not have the opportunity to buy their favorite records. However, Western fans didn’t have to suffer too long: In 1991, after the collapse of the USSR, the album was re-released internationally. The record was a collection of songs from the 1950s that McCartney loved in his youth - hits by Duke Ellington, Little Richard, Eddie Cochran, and other musicians. Back in the USSR broke several records in Soviet recording. It had the widest circulation among releases by foreign performers (over 500,000 copies), and it became the most expensive record in the world (collectors were willing to buy it for $150-$200). The album also became Melodiya’s largest export product. In 1981, the All-Union Gramophone Record Firm introduced an honorary prize called the Zolotoi Disk (Golden Record). It effectively became the Soviet version of the Grammy Awards, which is presented by the American Recording Academy in the United States. The main difference between the Golden Disc and its Western counterpart was the way the winner was selected - commercial success was much less important when it came to the Golden Disc awards. The Golden Disc was not split up into nomination categories and was awarded annually. The first winner of the award was the Central Lenin Museum for the series Leniniana on Record. The Golden Disc was also awarded to pianist Sviatoslav Richter, conductor Gennady Rozhdestvensky, and the Bolshoi Theater staff. The only foreign recipient of the Golden Disc was Paul McCartney, for his record Back in the USSR.